The Atlantic is an American magazine, founded in 1857 as The Atlantic Monthly in Boston, Massachusetts. Since 2006, the magazine is based in Washington, D.C. Created as a literary and cultural commentary magazine, it has grown to achieve a national reputation as a high-quality review organ with a moderate worldview. The magazine has notably recognized and published new writers and poets, as well as encouraged major careers. It has published leading writers' commentary on abolition, education, and other major issues in contemporary political affairs. The periodical has won more National Magazine Awards than any other monthly magazine. After experiencing financial hardship and a series of ownership changes, the magazine was reformatted as a general editorial magazine. Focusing on "foreign affairs, politics, and the economy [as well as] cultural trends", it is now primarily aimed at a target audience of serious national readers and "thought leaders". In 2010, The Atlantic posted its first profit in a decade. In profiling the publication at the time, The New York Times noted the accomplishment was the result of "a cultural transfusion, a dose of counterintuition and a lot of digital advertising revenue." As of 2016, its writers included Mark Bowden, Ta-Nehisi Coates, James Fallows, Jeffrey Goldberg, Robert D. Kaplan, Megan McArdle, James Hamblin, and Jeffrey Tayler. Throughout its 159-year history, The Atlantic has been reticent to issue electoral stances. In 1860, three years into publication, The Atlantic's then-editor James Russell Lowell endorsed Abraham Lincoln for his first run for president and also endorsed the abolition of slavery. In 1964, 104 years later, Edward Weeks wrote on behalf of the editorial board in endorsing Lyndon B. Johnson and rebuking Barry Goldwater's candidacy. In 2016, the editorial board endorsed, the third time since the magazine's founding, Democratic nominee Hillary Clinton in a rebuke of Donald Trump's candidacy. On January 14, 2013, The Atlantic's website published "sponsor content" about David Miscavige, the leader of the Church of Scientology. While the magazine had previously published advertising looking like articles, this one was met with wide criticism. The page comments were moderated by the marketing team, not by editorial staff; comments critical of the church were being removed while comments praising the church were being downvoted by readers. Later that day, The Atlantic removed the piece from its website and issued an apology. The Atlantic Monthly, Volume 113. Contributor Carl Sandburg Collections (University of Illinois at Urbana–Champaign Library). Atlantic Monthly Company. 1914. Retrieved April 1, 2013. ↑ "eCirc for Consumer Magazines". Alliance for Audited Media. December 31, 2015. Retrieved May 30, 2016. ↑ "Historical Facts About The Atlantic". The Atlantic. Retrieved July 21, 2016. ↑ "The Atlantic Monthly". Encyclopedia Britannica. ↑ "AgentQuery :: Find the Agent Who Will Find You a Publisher". agentquery.com. ↑ Berman, Judy (November 10, 2011). "Famous Magazines' First Covers". Flavorwire. Retrieved August 17, 2015. ↑ French, Alex. "The Very First Issues of 19 Famous Magazines". Mental Floss. Retrieved August 10, 2015. ↑ Chevalier, Tracy (2012). 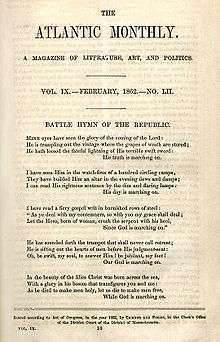 "The Atlantic Monthly American magazine, 1857". Encyclopaedia of the Essay. "The Atlantic Monthly was founded in Boston in 1857 by Francis Underwood (an assistant to the publisher..."
↑ Sedgwick, Ellery (2009). "A History of the Atlantic Monthly, 1857-1909". p. 3. "The Atlantic was founded in 1857 by Francis Underwood, an assistant to the publisher Moses Phillips, and a group of New ..."
↑ Whittier, John Greenleaf (1975). The Letters of John Greenleaf Whittier. 2. p. 318. 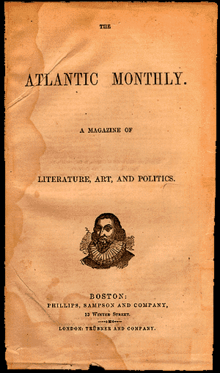 "..however, was the founding of the Atlantic Monthly in 1857. Initiated by Francis Underwood and with Lowell as its first editor, the magazine had been sponsored and organized by Lowell, Emerson, Holmes, and Longfellow. " ↑ Goodman, Susan (2011). Republic of Words: The Atlantic Monthly and Its Writers. p. 90. ↑ "The Atlantic". amazon.com. Retrieved October 7, 2010. ↑ "Home page". The Atlantic. Retrieved October 7, 2010. ↑ Peters, Jeremy W. (December 12, 2010). "Web Focus Helps Revitalize The Atlantic". The New York Times. Retrieved March 26, 2012. ↑ Kuczynski, Alex (May 7, 2001). "Media Talk: This Summer, It's the Atlantic Not-Monthly". The New York Times. Retrieved October 7, 2010. A change of name was not officially announced when the format first changed from a strict monthly (appearing 12 times a year) to a slightly lower frequency. 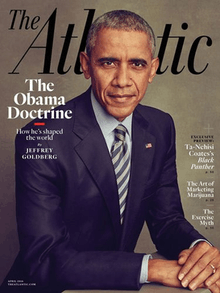 ↑ "The Atlantic's Masthead". The Atlantic. Retrieved March 26, 2012. ↑ "Editors' Note". The Atlantic. Retrieved October 7, 2010. ↑ Summers, Nick (January 31, 2011). "Exclusive: Ex-Gawker Guy Snyder to Head Atlantic Wire, New Manhattan Staff". The New York Observer. Retrieved March 26, 2012. ↑ Kinsman, Matt (September 15, 2011). "The Atlantic Debuts TheAtlanticCities.com". FOLIO Magazine. Retrieved March 26, 2012. ↑ Indvik, Lauren (December 19, 2011). "Inside The Atlantic: How One Magazine Got Profitable by Going 'Digital First'". Mashable. Retrieved March 26, 2012. ↑ Moses, Lucia (December 13, 2011). "'The Atlantic' Continues Expansion With Health Channel". AdWeek. Retrieved March 26, 2012. ↑ Kaufman, Rachel (January 19, 2011). "Alan Taylor Jumps to The Atlantic". Media Bistro's Media Jobs Daily. Retrieved March 27, 2012. ↑ Kafka, Peter (August 4, 2011). "The Atlantic Launches a Video Aggregator With a Twist". All Things D. Retrieved March 27, 2012. ↑ The Editors. "Martin Luther King's 'Letter From Birmingham Jail'". The Atlantic. 1 2 Feeney, Mark; Mehegan, David (April 15, 2005). "Atlantic, 148-year institution, leaving city: Magazine of Twain, James, Howells heads to capital". The Boston Globe. ↑ "Atlantic owner scours country for cinder-editor". New York Observer. August 29 – September 5, 2005. ↑ Kurtz, Howard (August 6, 2007). "The Atlantic's Owner Ponies Up". The Washington Post. Retrieved August 18, 2007. ↑ "Atlantic masthead". The Atlantic. Retrieved October 7, 2010. ↑ Carr, David (September 16, 2009). "Atlantic Hits the Wire With Lots of Opinions". Media Decoder Blog (The New York Times). ↑ Indvik, Lauren (February 2, 2012). "What's Next for The Atlantic Wire". Mashable. 1 2 Garber, Megan (September 16, 2009). "More on The Atlantic: Wire They Aggregating?". Columbia Journalism Review. ↑ "'Trimming the Times': The Atlantic Wire's new feature wants you to make the most of your 20 clicks". Nieman Journalism Lab. Retrieved March 26, 2012. ↑ "'Atlantic Wire' relaunches as 'The Wire'". Capital New York. Retrieved December 3, 2013. ↑ "The Atlantic Wire Relaunches as The Wire". Adweek. Retrieved December 3, 2013. ↑ "The Atlantic Cities". TheAtlanticCities.com. Retrieved March 26, 2012. ↑ "The Atlantic Debuts TheAtlanticCities.com". Folio.com. Retrieved March 26, 2012. ↑ "Introducing CityLab.com: All Things Urban, from The Atlantic" (Press release). The Atlantic. May 16, 2014. Retrieved May 17, 2014. ↑ Capps, Kriston (June 2, 2015). "Explore the Digital Lives of Global Highrises in 'Universe Within'". CityLab. Retrieved June 5, 2015. ↑ Brian Stelter and Christine Haughney, "The Atlantic Apologizes for Scientology Ad", January 15, 2013, The New York Times.